The Metropolitan Police needs to "up its game" when it comes to dealing with victims of crime, a report says. 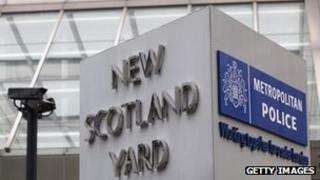 The London Assembly said the Met had the worst victim satisfaction rating of any police force in the country. The report adds that the force has left 115,000 victims of crime dissatisfied with its performance. The Met said victim support was a priority and that it was rolling out initiatives such as offering all victims a visit from a police officer. According to the report, Duty of Care: Improving support for Victims of Crime, the Met's victim satisfaction rating was 74% in the 12 months to June 2012 with 16% dissatisfied with the service. Nearly 720,000 victim-based crimes were recorded during that period. In Hackney, Enfield and Tower Hamlets, less than 70% of victims were satisfied compared to 80% or more of victims in Kingston and Sutton. Closer co-operation in dealing with victims across the whole criminal justice system. The report also calls for the mayor's office to set challenging targets for improving victim satisfaction ratings. Joanne McCartney, chair of the police and crime committee, said: "Our investigation into the care and support offered to victims of crime shows that Londoners are not getting the service they deserve, nor that the police want to deliver." Deputy Assistant Commissioner Helen Ball said the force launched its Total Victim Care strategy in April 2012 with a renewed focus on improving the service victims of crime receive. Since then, it had seen a 3% increase in victim satisfaction. "As the commissioner has made clear, the Met wants to be the best police service," Ms Ball said. "For those recommendations that we have not already taken action on, we will now see how they can assist us to improve and provide victims of crime the consistent, professional service they deserve."